Jason Dority has been writing health-related articles and developing community resources for healthier lifestyles since 2007. He currently works for the Indiana University School of Medicine's Diabetes Translational Research Center. Dority holds a Master of Science in biology from Indiana University. The milkshake is a classic treat for a hot summer day. McDonald's offers a Triple Thick Shake in chocolate, strawberry and vanilla flavoring and four different sizes. 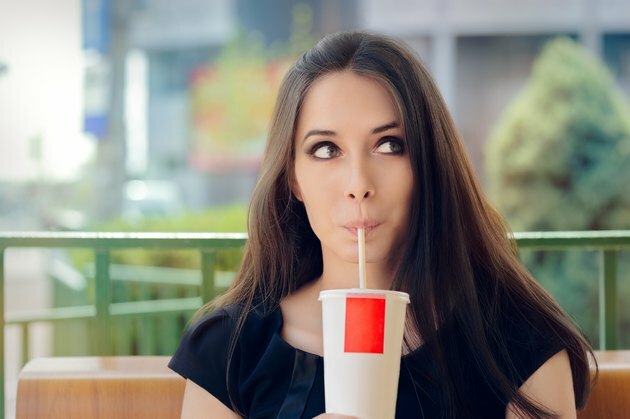 It may be reasonable as a indulgence every now and then, but McDonald's milkshakes pack a lot of unnecessary calories and fat, as well as other nutrients that you should limit to maintain a healthy diet. Milkshakes from McDonald's are high in calories and fat with the largest sizes containing over half the recommended calories and fat per day, based upon a 2,000 calorie diet. The Triple Thick Shakes are available in 12, 16, 21 and 32 oz. size cups and contain between 420 and 1160 calories. The fat content is in the range of 10 to 27 g of total fat, 6 to 16 g of saturated fat and 0.5 to 2 g of trans fats. The Institute of Medicine recommends limiting daily fat intake to between 20 to 35 percent of your total calories, or approximately 44 to 78 g of fat per day. A 32 oz. milkshake containing 16 g of saturated fat and 2 g of trans fat contains all the recommended limit of saturated and trans fat per day, according to the American Heart Association. Consuming a diet high in saturated and trans fats can raise cholesterol levels and increase the risk of heart disease and stroke. The American Heart Association recommends limiting total cholesterol intake levels to less than 300 mg per day and sodium intake to less than 1500 mg. McDonald's Triple Thick Shakes contain 40 to 100 mg of cholesterol and 130 to 510 mg of sodium, depending on size. A 32-oz. shake from McDonald's contains over 30 percent of the daily value of cholesterol and sodium. Consuming a diet high in cholesterol increases the risk of cardiovascular disease, the number one cause of death in the United States, and a high sodium diet may raise blood pressure levels. The McDonald's Triple Thick Shakes are high in carbohydrates and sugars with 72 to 203 g of carbohydrates and 54 to 168 g of sugar per milkshake, depending on size. The Institute of Medicine recommends 130 g of carbohydrates per day for both adults and children. The 32-oz. shake provides well over the recommended daily allowance of carbohydrates. As for sugar, the American Heart Association recommends limiting daily sugar intake to approximately 25 g for women and 38 g for men. The smallest milkshake from McDonald's contains nearly double the amount of recommended sugar and the 32-oz. shake contains 4 to 6 times the recommended amount. Excess sugar is not a necessary component of a diet and can contribute to weight gain. The Triple Thick Shakes from McDonald's contain a good amount of protein and only the chocolate-flavored shake contains any dietary fiber. The milkshakes contain between 9 and 27 g of protein per milkshake and the chocolate milkshake contains 1 or 2 g of dietary fiber, depending on the size. Adult and adolescent women and men should consume 46 to 56 g of protein per day, respectively, while children need between 13 and 19 g per day. Although the milkshakes are high in protein, an important component of a healthy diet, they are not a great way to attain protein due high amounts of calories, fat and sugars. McDonald's Triple Thick Shakes do provide small to large amounts of a few vitamins and minerals. The largest shake at 32 oz. provides up to 90 percent of the daily value for calcium, 40 percent for vitamin A and 20 percent for iron. It also provides up to 4 percent of the daily value for vitamin C. On the low end, a 12-oz. shake provides 15 percent of the daily value for vitamin A, 30 percent for calcium and 2 percent for iron.